"It’s going to be used as a tool for greater political terrorism," says one former government loyalist who now campaigns with the opposition. MIAMI ­— As investigators in Venezuela grill six suspects for details in an apparent assassination attempt against President Nicolas Maduro, opposition leaders and some analysts worry that the socialist government could use the attack to further crack down on opposition leaders. On Monday afternoon, hundreds of pro-government supporters marched in the central part of the Venezuelan capital, Caracas, in support of Maduro. Many of them were state workers wearing red T-shirts and holding Venezuelan and Cuban flags. Meanwhile, opposition leaders are criticizing Maduro, who has become deeply unpopular, for pointing his finger at political opponents. Many of them are warning that Maduro may use the attacks to further suppress his critics. “The government’s threats related to the incident make it clear that it is being used or it’s going to be used as a tool for greater political terrorism, greater persecution and greater violations by the state,” said Nicmer Evans, a former government loyalist who now campaigns with the opposition. Peter Hakim, president emeritus and senior fellow at the Inter-American Dialogue, a Washington think tank, said the situation can lend itself to being used as an excuse for further crackdowns. “At the same time, he’s in a position where he can afford to show some benevolence,” said Hakim, citing that the opposition is fractured and essentially ineffective and people have been fleeing the country, including those who oppose Maduro. Venezuela’s government said the six suspects collaborated with others in Miami and its South American neighbor Colombia, which is preparing for the inauguration of its new president on Tuesday. Colombia’s Foreign Ministry said it “emphatically rejected” Maduro’s accusations. White House National Security Advisor John Bolton said Sunday, “I can say unequivocally there is no U.S. government involvement in this at all," suggesting it could be a "pretext" set up by the government itself. Maduro, who succeeded socialist President Hugo Chávez after his death, often accuses the opposition and the U.S. of collaborating to foment a coup against his government. He said the attack is direct proof that there is an international plot to overthrow his leftist administration. 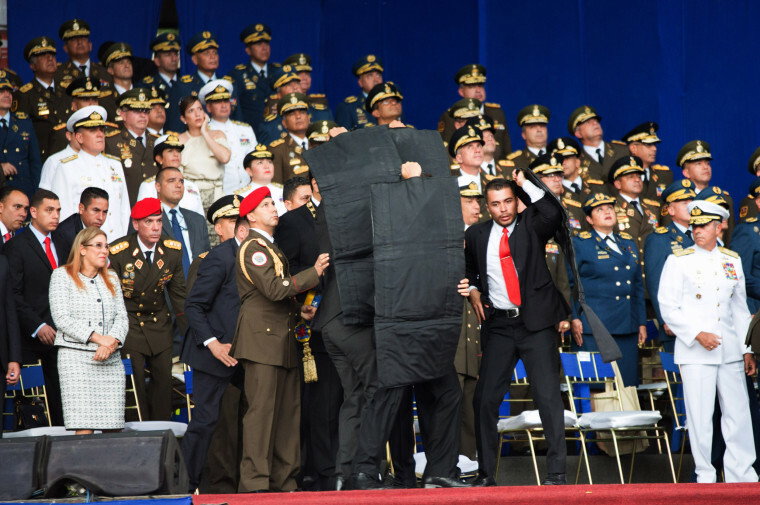 The incident took place on Saturday afternoon as Maduro spoke to hundreds of troops during an outdoor rally celebrating the 81st anniversary of the National Guard. Video of the explosion shows participants of a military parade scrambling in panic. “I think it’s evidence of Nicolas Maduro’s vulnerability,” said José Colina, a former Venezuelan military officer who now resides in Miami and is a leader of the Venezuelan exile community. According to Interior Minister, Nestor Reverol, two drones packed with 2.2 pounds of C-4 plastic explosives were flown toward Maduro, his wife and other top leaders. One of the drones was supposed to explode above Maduro while the other was to be detonated in front of him, according to Reverol. The military knocked one drone off course electronically and the other one crashed into an apartment building two blocks away, according to the official account. A little-known group, the National Movement of Soldiers in T-Shirts, claimed responsibility for the attacks. Venezuela is suffering from a severe economic and humanitarian crisis. Hyperinflation has skyrocketed and chronic shortages have left many malnourished and dying of preventable diseases and infections. The dire conditions have caused tens of thousands to flee across the border into Colombia and Brazil. Maduro has become deeply unpopular. Foreign nations, including the U.S., have been slapping economic sanctions on a growing list of high-ranking Venezuelan officials. Despite the efforts, there are no clear alternatives to the crisis, said Hakim, referring to the situation in Venezuela as chaotic and corrupt.